This is by far the most talked about feature. And I gotta admit that it looks pretty awesome on your computer. I personally think it’s especially great to use at night to lower the amount of blue light we’re receiving. 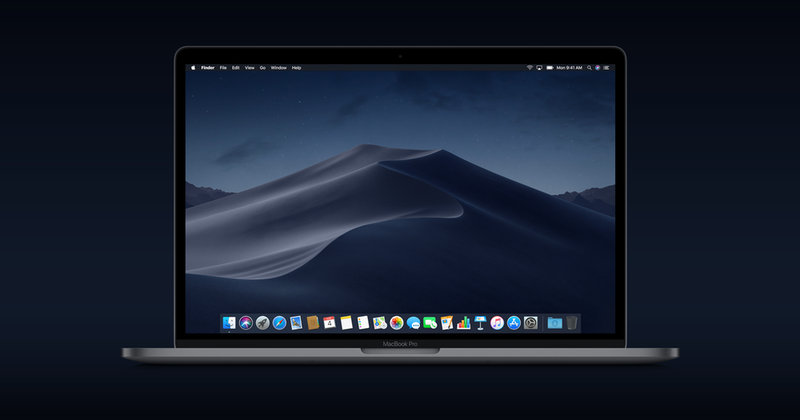 You can scroll down below to learn about an app every Mojave user needs so you can use Dark Mode at night. To enable Dark Mode go to System Preferences > General > Appearance. There’s nothing worse than a super cluttered desktop. It’s like having a cluttered and messy desk, it sets the tone for your mental space. 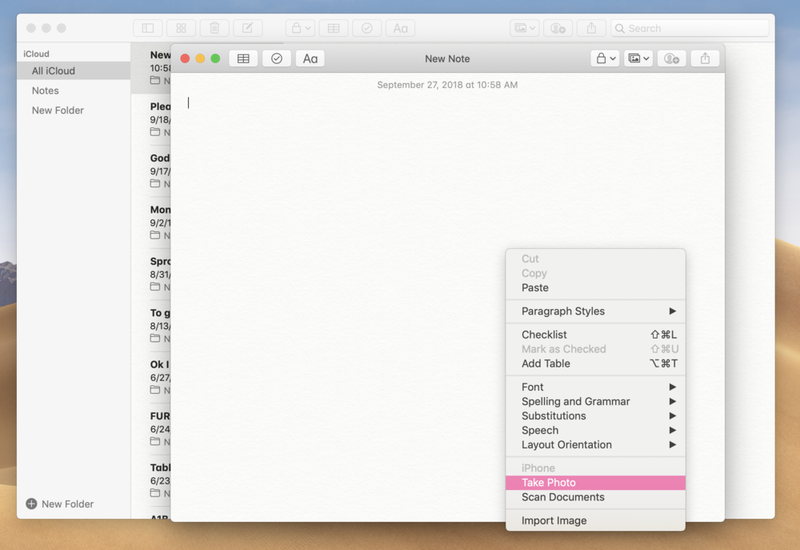 Stacks now groups items on your desktop by kind and stacks them so you can effortlessly free up clutter. Make sure that you control-click on your desktop and select “Use Stacks” to enable them. Just like dark mode, I love that Apple is helping us reduce blue light. And not to mention it just looks awesome as your desktop changes from day to night. Currently, there are only two dynamic desktops available, but I’m hoping we’ll see more down the road. The new screenshot and recording options are pretty amazing. It's now easier than ever to take a screenshot or even record your screen. I know this is really going to come in handy when I need to share something with a client or send a quick “how-to” video to someone. To use the new screenshot features, click Command + Shift + 5. This is by far one of the coolest features of Mojave. Continuity Camera allows you to quickly snap a photo with your phone or scan a document and then send it in an email or a attach it to a note on your computer. I think this is kind of a game changer feature and I’m really looking forward to using this. To use, Command-Click in Mail, Notes, Pages, etc. and select Take Photo or Scan Document. Make sure your computer and iPhone are on the same wifi and have Bluetooth enabled. This is a cool new feature for Spark. 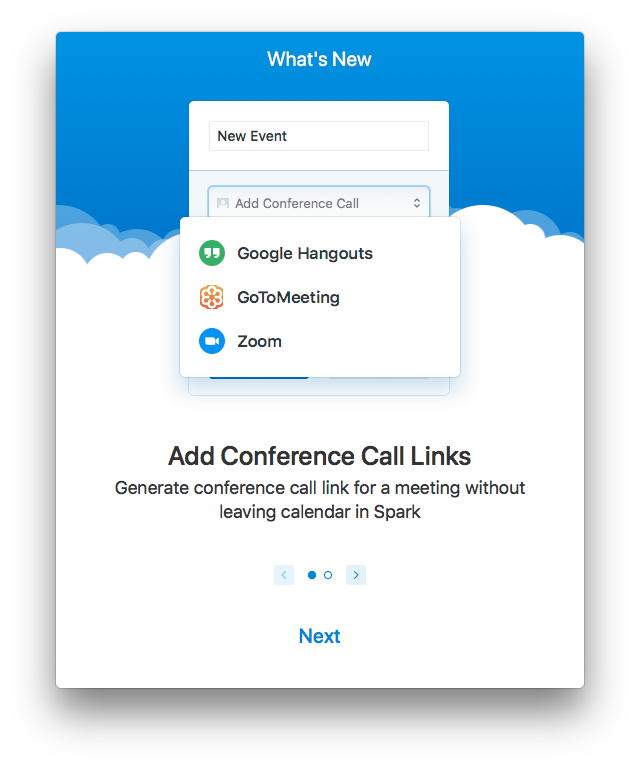 If you’re like me and use Zoom or another video conference app with clients, you can now send them a conference link directly from your calendar in spark. I think this is going to be helpful for making scheduling super quick. I’m so excited about this feature. If you’ve ever tried to decide on a restaurant with a group of people, you know just how frustrating and hard it can be. Google Maps just released a new feature in their appso that you can do group polls to make deciding on a restaurant easier. You can read more about it here. Did You Miss My Facebook Live on How Mojave Screwed Up My Computer? 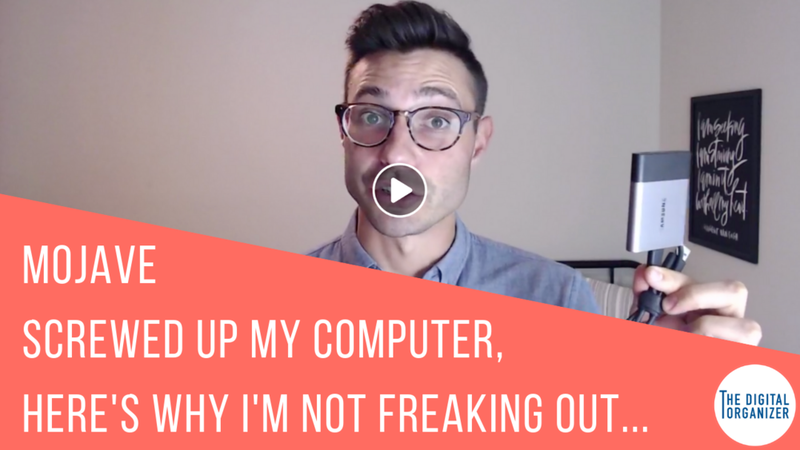 Did you miss my Facebook Live last week on how Mojave totally screwed up my computer? If so, you can catch the replay here. I talked about what went wrong when I tried updating to Mojave and the steps I took before and after to safeguard my digital space. I’ve also started my YouTube channel and will be posting all of my episodes of The Digital Sanity Show each week. Make sure to subscribe to my channel so you don’t miss a thing! My sister-in-law just told me about this app and I think it’s pretty brilliant. If you need a handyman on demand or other home services like housecleaning or yard work, you can use this app to get someone to help you the same day. I’m sure this is going to be a big help for those odd jobs you aren’t sure who to call for. Download the app here. You can use my code B20C609 to get a $10 account credit! If you’ve updated to Mojave and wish you could toggle between Light and Dark Mode or set it to get dark at sunset, you’re in luck. This is something that has been a little bit annoying until now. Luckily, NightOwl is a tiny little app that solves this exact problem. You can download it here for free and easily switch between modes, schedule when you’d like it to get dark or light or have it in sync with the sunrise and sunset. I'm currently at the beach with my family this week soaking up some sun. I'll be back on Facebook Live next Wednesday Night at 8 pm Central, so mark your calendars! This week I'm at the beach with my family so I am out of the office and will not be responding to emails, calls, or texts until next week. If you're wanting to schedule a session with me, I recommend doing that ASAP because my schedule is filling up quick! You can schedule that right here. Are you considering upgrading to the new operating system Apple just released? Before upgrading to Mojave, there are a few things you must do. Every time you upgrade your operating system your computer will either get better or worse. If your computer is already having issues it may solve them, or really screw it up. I want to make sure you’re ready for the possibility of something going wrong, as slim of a chance as that may be. Here are a few quick things to do to make sure you upgrade safely. I am so excited about Mojave! There are so many cool features that will make you want to update. To see a full list go here. here are five things you must do before you upgrade so that you ensure you keep your most precious memories and documents safe. This is an important step you so make sure your Mac is running smoothly and operating at its best before you upgrade. Sure, upgrading will help your Mac run great, but it’s best to get rid of duplicate and unused files, optimize your storage, and clean out anything that’s unnecessary before you go through with the upgrade to Mojave. My favorite tool to use for cleaning up your computer is CleanMyMac X. You can download it and run it. It’s $39.95 for a year subscription or $89.95 for life (which is what I recommend doing). The best way to do this is to create a clone of your computer using an application like Carbon Copy Cloner from bombich.com. If something goes wrong in your upgrade, you can restart ANY Mac with your backup drive plugged in and all your files show up exactly the way they were at the time of your last backup. This gives me total confidence that anything can happen to my computer and my files are safe. You don’t have to buy it unless you’re planning on using this day to day. The trial will get you a functional backup right away with no strings attached. 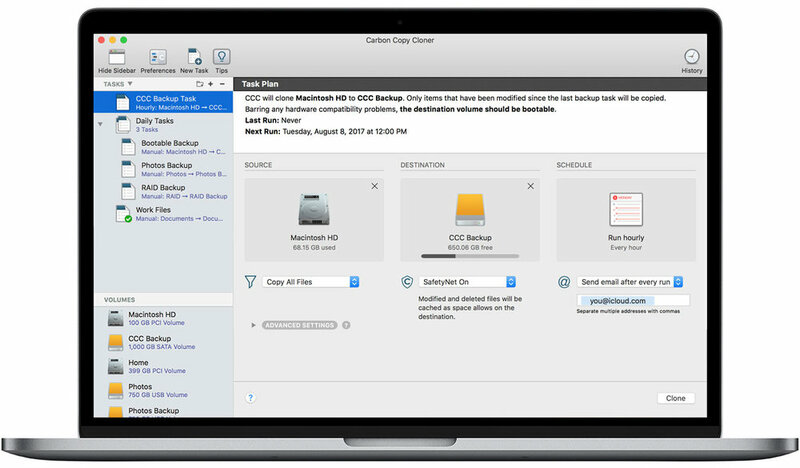 Time Machine: This is the most common way Mac users backup their computers. It’s really easy and automatic. Get an external drive, plug it in and you should be prompted to use it as a backup. If not, just go to System Preferences > Time Machine > Select Backup Disk. If your hard drive is formatted for a PC, they will ask if it’s OK to erase the external drive to be set up for Mac. If there’s nothing you need on that drive, go for it! Option #3: Manually copy files to an external drive. You can open up Finder and go to the different folders on your Mac such as Documents, Downloads, Music, Pictures, and Movies and drag them onto your external drive. This makes sure your main files are backed up, but it’s not bringing over your saved bookmarks in Firefox, or address book and things like that. If something go wrong, you’ll have a lot more work to do to get back up and running, but at least you will still have your files. I highly recommend having a backup of your computer on the cloud. I have this in addition to a physical Time Machine backup in case of fire, flood or theft and both my computer and backup drive are unavailable. If something goes wrong though, you still have all your stuff. Keep in mind you can’t download 500 GB of data in a flash like you can with an external drive. I have both Time Machine and Backblaze. My cloud backup is there just in case everything else fails. My favorite tool for cloud backup is Backblaze. This is what I recommend to my clients. 3. Make sure the apps you use are compatible. If you’re using a special 3rd party apps that are not usually ready for an operating system upgrade, you can go here to find out if the specific app you are concerned about. If it’s not compatible yet, hang tight, and check back every week or so. You will at least be asked what your iCloud password is. This is the same as your Apple ID, App Store password etc. While you’re finding them, I recommend getting set up with an app called 1Password. Check out my post on passwords. 5. Use Disk Utility to scan your hard drive to see if it has any issues. This isn’t a really thorough test, but it’s easy and fast. Use Spotlight (the magnifying glass in the top right corner of your screen) to search for Disk Utility. Once open click on Macintosh HD > First Aid > Run. I usually do this once a month. Once you have backed up, made sure your apps are compatible, checked you have at least your iCloud password lined up, and have run disk utility, pull the trigger! While you’re waiting for the installer to download, learn more about all the cool new things your Mac is going to be able to do! Computer slow and need some help? Not sure if you should buy a new computer or upgrade your old one? Book a session with me and I can help you upgrade safely! Schedule your session here. I can’t stress enough how important two-factor authentication is for your accounts. And this is pretty cool. Google came out with a USB and Bluetooth key that serves as a physical two-factor authentication and it must be present when trying to log in to accounts. It’ll help protect you from phishing so the people you don’t want in your accounts, can’t get in. You can learn more about it here. Facebook has officially launched their new app, Dating, in Columbia with plans to launch in other countries in the future. It makes sense that they would be trying to reach younger generations since it seems most of us are using other social apps like Instagram and Snapchat. Interestingly though, it looks like they’re trying to steer away from the industry norm of ‘swiping’ and create more opportunity for better connections. You can read more about the app here. Last Week On Using the New iOS 12? You can catch the replay here! I talked all about how to use iOS 12’s new features to be more productive at work and more present at home. 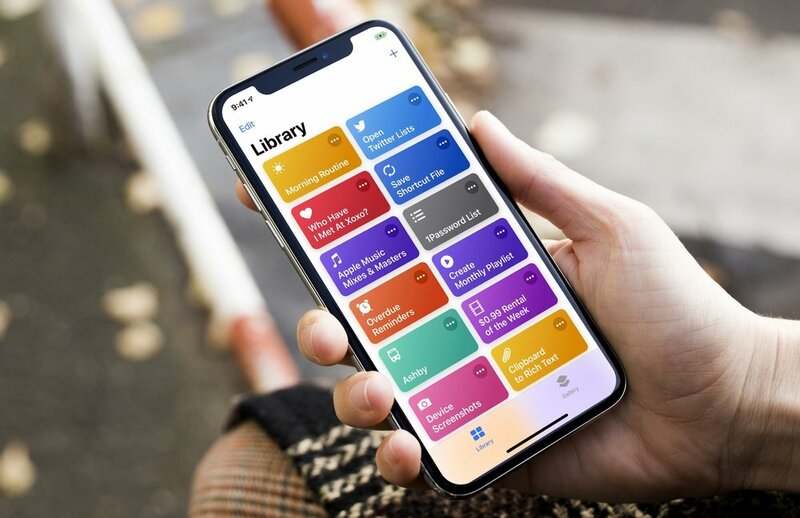 I walk you through step-by-step how to use iOS 12 to your advantage! Hopefully you’ve gone ahead and downloaded the new iOS 12. One of my favorite features is Siri’s upgrade. And now with Shortcuts you can even make Siri work harder for you by following multiple-step commands. I talked about how I’m using it in last week’s Facebook live. If you’ve completed my 5 steps to prepare your mac to upgrade to Mojave, it’s time to download and install it! Simply open the App Store, click Updates and it should be at the top! I recommend doing this when you know you won’t need to use your computer for a few hours. When the download has finished, continue by following the prompted instructions. 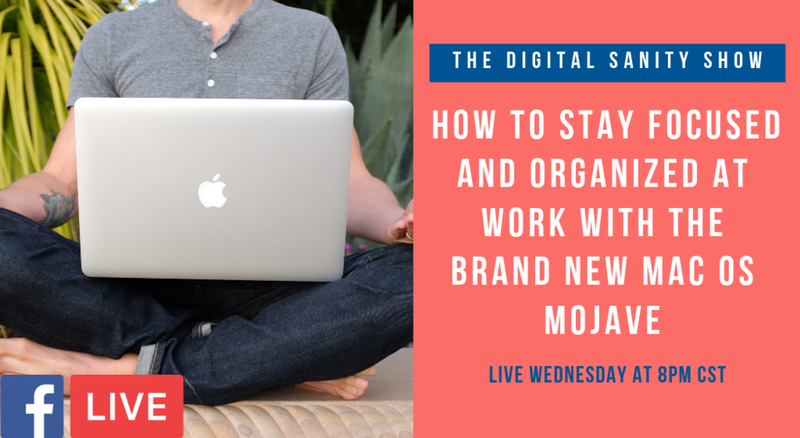 Join me Wednesday night on Facebook live! Click this image to be notified when I go live on Wednesday at 8 PM CST. This week it’s all about how to use Mojave! Bring me your questions! Tired of friends or family logging onto your computer and signing you out of your sites and downloading random files to your computer? I just had a client reach out to me because he has a computer that he lets people use frequently. They are constantly logging into their Facebook, Dropbox, and other accounts and often downloading files. Almost never do these people log out of their accounts or delete the downloads. All of us deal with it, some more than others; it’s that annoying ding, vibration or alert letting you know that you have another email. We check it quickly, just to see another shipping notification from Amazon or some other unimportant email that distracts you from your work. This post is about keeping you focused and saving you time, our most precious commodity. "Do I need a new computer or can we do something to this one to make it faster?" The first conversation I have with a client almost always starts off with this question followed by a statement of frustration. This includes: "This thing is soo slow!" "I keep running out of space!" "My email is not working right" or a combination of all three and others. We've all had to jump through the seemingly endless hoops to reset passwords we've forgotten. When I worked at Apple, I sometimes felt like the majority of my day was spent resetting passwords for our clients. How frustrating to be trying to set something up with these ultra-nerds in the store and you can't remember your dang password. The funny thing is most of the employees at the store have the same problem, at least those who don't have a password manager. Enter my favorite app.... 1Password. How much time are you spending searching through your email looking for that email you were supposed to respond to but forgot? How often do you find it? I have a simple solution for this and it does not include a huge email folder system that only the so called “Power Users” use. This system may not be for everyone, but it for the majority of us. So you know those 13,000 unread emails sitting in your inbox that you keep promising yourself you’re going to read? Let me clue you into something, YOU’RE NEVER GOING TO READ THEM! Let’s take some action right now to give you a fresh start with your email. I’ve got three steps for you to follow to make this happen.